Whether you work for Chili's Grill & Bar, Maggiano's Little Italy or as part of our Restaurant Support Team you're part of our family and we will do everything we can to help you succeed. We are passionate individuals committed to inspiring others by bringing California Creativity to every meal. We champion the individual and encourage everyone to Be Bold, be you, and be Epic. 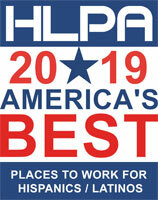 Each year the HLPA matches the Nation’s Top Hispanic / Latino Talent with America's Best organizations by identifying and listing quality organizations who are currently hiring and have a commitment to Diversity & The Hispanic / Latino Community.